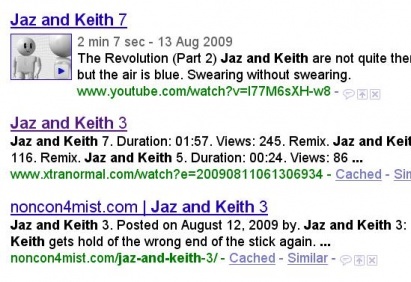 So the top three sites for ‘Jaz and Keith’ are YouTube, Xtranormal and Noncon4mist – cool! I expect it has something to do with the fact that Jaz is not a common name (especially not together with Keith!) which is why I’ve picked relatively unusual names for my new series of animated videos too; Melody and Sabrina. 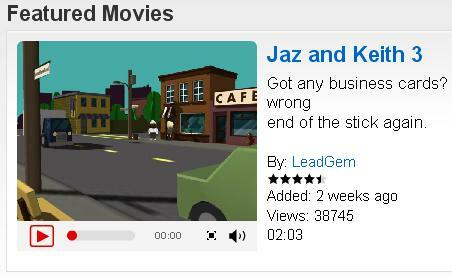 In other Jaz and Keith news; Episode 3 has been seen by over 38,000 people! And most people seem to like it. Some people have commented that they like the whole series, which is always encouraging. I have now upgraded to the paid account in Xtranormal, so I have access to a lot more characters, backgrounds and voices. And premium members also get to download STATE the animation software for free, which I will do when they release their new version soon. 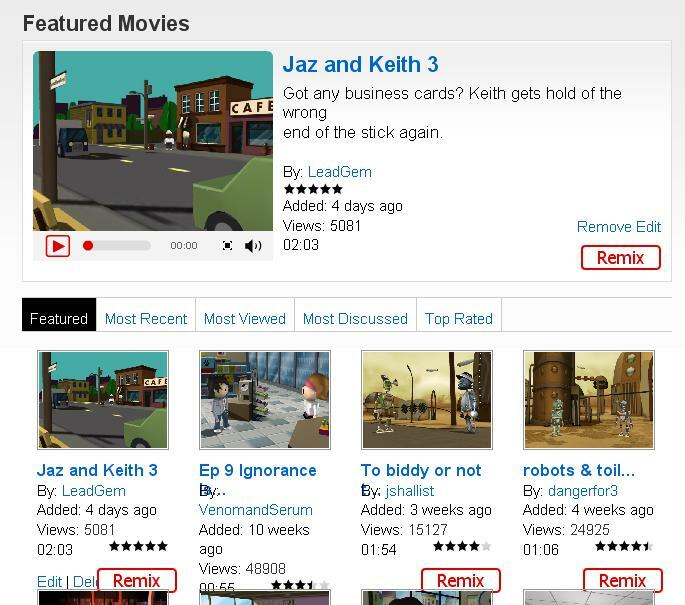 My Jaz and Keith 3 movie has got over 5000 views on the site it was created on; Xtranormal.com after only 4 days because it was chosen to be featured. Featured movies sit at the top of the page called ‘Watch Movies’. I asked on the forum if they would consider featuring it, thinking this would automatically mean all my other videos would get lots of views too. But I underestimated people’s apathy. When I see a movie on there that I like, I naturally watch the others in the series, but I guess most people won’t do that unless you spoon feed them. So I’ll ask them to feature more of my movies. Although it is evident that some people must have clicked on my other stuff because my other movies’ numbers are higher than others’ who have not had any movies featured. And at least people seem to like my featured movie. It’s getting good ratings anyway. One is; people comment on your video. Nothing wrong with that, except a lot are very spammy comments, and they can’t be buried or deleted. Annoying comments such as “Watch mine” followed by either 18 identical links or links to all of their movies. And there is no limit to the length of the comment, so people put huge gaps in between lines of nonsense to make you scroll down for miles. A lot of them have no manners and have bad language in their comments, and they don’t even bother to comment on the movie at the top of the page. The second disadvantage to being featured (or even being available on the site at all) is worse: people can STEAL your movies! I’ve told them what I think about it on the forum, but unless a lot more people complain they’re not likely to do anything about it. Although there is a choice about whether you make your movies public or private, no-one is ever going to see them if you choose Private, are they? So I’ll wait to see what happens with my movies so far. Since my movie was featured it has received a comment saying “cool video i am takeing this one”. His current videos are not up to much, so a half intelligent one will stand out like a sore thumb. If it gets out of hand, I’ll make my movies private and just publish them on YouTube. At least when people embed your videos from YouTube, they can’t claim it to be theirs. That people can remix the videos of others is also a shame because if I see an Xtranormal movie I like, how do I know it was actually created by that person? It would put me off praising them for it, and I’m a definite believer in praise and credit where it is due. I guess unless I know otherwise, I’ll just have to trust them.